0% brokerage - call for best deals. Alta Vista is a residential joint development of Spenta and Sabari Group. Located in the midst of Chembur East, Mumbai, it is built across a wide area. These luxurious 1BHK, 2BHK and 3BHK housing units make it a dream home to everyone. These apartments are beautifully crafted with modern amenities and are approved by Maharashtra RERA. What is the project location?The project is located at Chembur (East), Mumbai Harbour. What size of flats are available in Alta Vista? The apartment sizes in the project vary from 419.0 sqft to 1005.0 sqft. 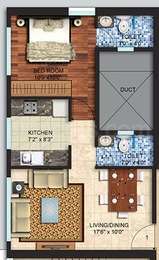 What is the area of 1 bhk in Alta Vista? 1 BHK units in the project are available in a size of 419.0 sqft to 463.0 sqft. What is size of 2 bhk in Alta Vista? The area of 2 BHK apartments ranges from 624.0 sqft to 764.0 sqft. What is total area of 3 bhk in Alta Vista? 3 BHK units in the project are available in a size of 904.0 sqft to 1005.0 sqft. How much is the total size of Alta Vista?The project is spread over an area of 2.15 Acres. Special rate for IIFL Customer. more details please call on nine one six seven nine nine seven four nine eight.